William Lee-Hankey, print maker, painter in oils and watercolours. He was born in Chester and upon leaving School, he worked as a designer whilst studying art in the evening at Chester School of Art. He later attended Royal College of Art and won many prizes for his work. 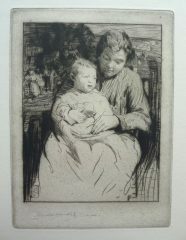 He married the artist Edith M.Garner and taught etching at Goldsmiths Art College. In 1894 he began exhibiting in London and became a member of the Royal Institute in 1888. He was President of the London Sketch Club in 1902 to 1904. He had a house built in Le Touquet, France and a studio in Etaples where he spent long periods of time. During the First World War he served in the Artist’s Rifles . He won a gold medal at the Barcelona International Exhibition and a bronze medal in Chicago for his work. In 1936 he became a member of the Royal Watercolour Society and acted as its Vice President (1947-50) His paintings are found in various collections such as Luxembourg Museum, Berlin, Prague National Gallery, South Africa, Budapest, New Zealand, Melbourne, Ottawa, Bradford and Liverpool.